Interestingly enough, most of the discussion about this chart surrounded one of the lesser-used form fields – key pain point. How should you ask for key pain points? “Pose this as a poll so that prospects could see what their peers are thinking and whether they’re as far along implementing technologies as their peers,” Bob suggested. And when should you not ask? 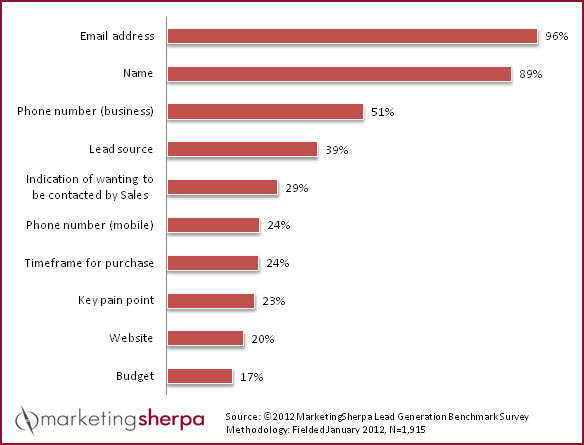 Of course, only 23% of marketers consider key pain point an important lead gen form field, and for good reason. Of course, this isn’t merely a philosophical question. After all, less form fields usually equals more form fills. “It would be interesting to correlate fields on landing page forms with completion rates,” said Prugh Roeser, founder, LeadMaker. While we don’t have that specific information, we do know that it is worthwhile to test lead form length. And when you do, you’ll likely find that the longer the form (and, especially, the more friction in the form), the lower the conversion rate. For example, Marketo discovered that a shorter form yielded a 34% higher conversion rate in this test. Aside from the tendency of lower conversion rates in longer forms, Prugh went a step further and questioned whether you’re getting what you really want from prospects who do actually take the time to complete the longer form. Prugh also discussed the mix of marketers who filled out the benchmark survey, and how they might have different goals with their lead forms. As you can see from the below data broken out by primary market from the MarketingSherpa 2012 Lead Generation Benchmark Report, Prugh has a point. B2B marketers clearly feel that they need (and, presumably, can get their prospects to provide) significantly more information. 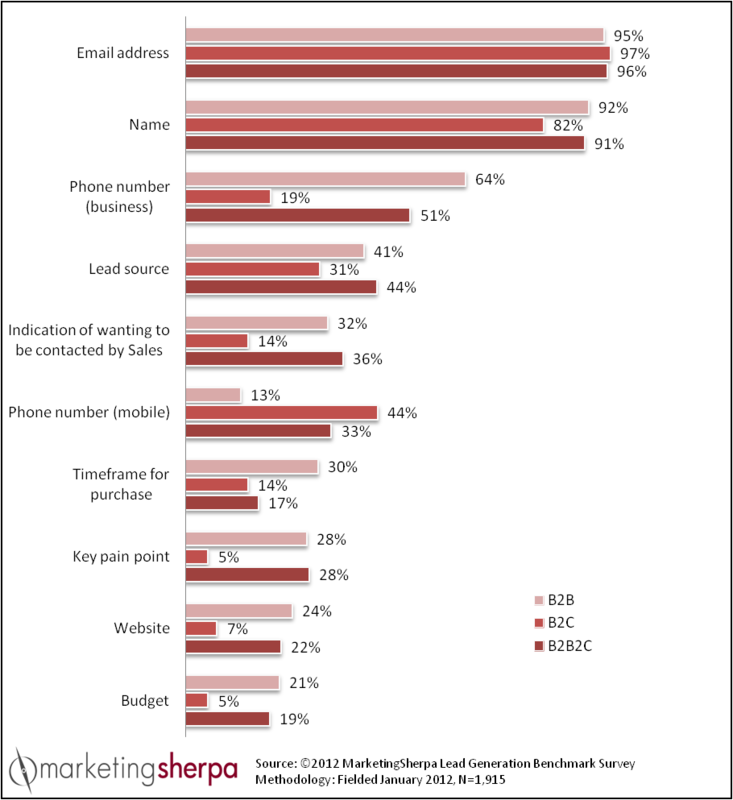 The one notable outlier field where B2C marketers are more demanding is mobile phone number. If you would like to feature your tips and analysis about MarketingSherpa research in a future blog post, sign up for the MarketingSherpa Chart of the Week newsletter and provide your insights to a chart that resonates with you.